The Cisco Catalyst 3560E-12D, a 12-port 10 Gigabit Ethernet switch offers flexible and highly available aggregation solutions for nonstop unified network services. Dynamic routing, dual hot-swappable power supplies, and redundant field-replaceable fans enhance switch availability. 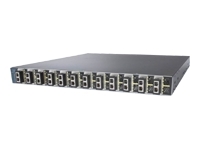 Compatibility with the Cisco TwinGig module makes the Cisco Catalyst 3560-E Series aggregation switches ideal solutions for networks undergoing a gradual upgrade from Gigabit Ethernet to 10 Gigabit Ethernet. This future-proofs the network for forthcoming business growth while reducing the total cost of ownership. The Cisco Catalyst 3560E-12D is well suited for space- and power-constrained deployments because of the compact 1RU form factor, economical power needs and efficient cooling. Ideally suited to support secure converged applications such as Cisco TelePresence and unified communications, the Cisco Catalyst 3560E-12D delivers high-performance intelligent switching with the robust feature set.